Traditionally the Queen of Cups appears as a very passive figure, her most positive qualities shining through. This card attempts to reflect the Queen of Cups in her totality without the necessity of card reversal to interpret her darker or blocked energies. From an elemental perspective, the Queen of Cups is “water of water” (cups = water, queens = water), and according to Rachel Pollack one, if not the most balanced card in the Minor Arcana. The cardinal direction associated with cups is West, which corresponds to the cardinal association with magic. In Tarot, water is said to represent emotions, intuitiveness, and mystical connections. Outside of Tarot we also see water associated with sensuality. During the research and design phase I found myself reflecting on how the Queen of Cups also embodies some of the qualities of various Major Arcana cards: the High Priestess, Empress, Temperance and of the Moon card. This card was designed taking all of these elements into consideration, and giving life to my concept of the Queen of the Cups. The card features a mermaid as its central figure. Throughout the world we find myths and art featuring mermaids. Mermaid lore ranges from mermaids rescuing the lost at sea, nurturing caring creatures who sometimes marry human males, and others as a vain and evil seductress leading sailors to their death. Her sensuality and beauty is acknowledged by most, whether as a virtue or as her weapon. Taken collectively I find these myths and legends to represent both the light and darker sides of the Queen of Cups, which is why a mermaid was chosen to represent this court card. In addition, in studying faerie lore I have learned that mermaids are sometimes classified as being faeries, which adds to the sensual, mysterious and mystical side of this queen. 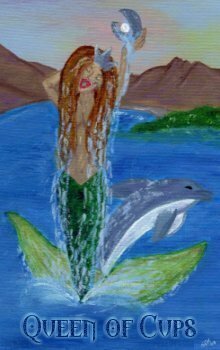 Furthermore, in some myths and lore (including faerie lore) dolphins have been believed to be mermaids in disguise hence the image of the dolphin leaping basically out of the mermaid. The Mermaid represents the mother, Empress and High Priestess of the sea, and embodies the life giving forces of the sea, which can be associated with love, creativity, sensuality and spirituality. Her half-human half fish form is the meeting of land and sea (Temperance) to create life. This is also reflected in the bay from which she emerges. As water and land meet life is created as depicted by the green patch of land with white flowers on the right hand side of the card. The bay is the uterus, and the earth the mother. The two mountains in the background represent the nurturing breast of mother earth. The cup she holds is in an opened oyster shell, which reveals a pearl. The cup is held above her in her left hand, both symbols of her femininity and receptivity. The mermaid faces left signaling the magic and mystery that she holds. Her crown is silver like the moon, again a representation of her femininity, mystery and allure. The crown has three peaks, each representing a face of the Triple Goddess. The bay is calm, or appears calm, a quality that can be quite deceiving in the sea. The mermaid emerges from the bay in an unrealistic position, almost standing upright with her tail only slightly bent and behind her. This ethereal quality of emerging and floating is reflective of the illusions she can create: her veil of illusion. She is also singing with her eyes closed, her song could be one of empathy, love and compassion or one designed to entrance us and lead us to disaster. It is in her extremes that I concur with Rachel Pollack that she is very balanced, she is a message to remember middle ground. Not be ruled by emotions or blinded by them. She is also a reminder that to truly be able to give of ourselves to we need to learn to receive others. The Queen of Cups symbolizes love (motherly and/or sensual), receptivity, and sensuality. Depending on the question and location in a spread she can reflect peace and harmony or warn us that we are creating a veil of illusion for ourselves. Emotional balance is needed for healthy relationships of all types, and for true nurturing and love to take place. Too much of a good thing can be addictive and lead us to disaster, even if it seems harmless at the time. When we wake from the fantasy we have created for ourselves we could find ourselves in trouble. Her gentle and loving side is also very spiritual and intuitive; however, when we get lost in her song we can fall prey to over-fantasizing. Like the calm waters, she is more active than she appears. The original painting of this card, by Jewel, was done in acrylics, on an 8” X 10” canvas. The canvas was then scanned and graphically enhanced by Pollux in Paint Shop Pro 7.0. Jewel has been studying tarot for over 8 years, and considers herself an eternal student of the tarot with a major interest in its academic aspects and use for personal growth. Her uses of tarot vary from comparative studies between decks, to spiritual development, to story telling. Her dream is to understand the Qabalistic associations of the tarot enough to publish a comparative study of various decks in a manner that new students could follow see and understand. She is an avid deck collector, with over 100 decks. Her primary deck of choice the Cosmic Tribe.